Just in time for SHOT Show, Sticky Holsters is unveiling a bevy of new products for Concealed Carry EDC. We have been reviewing Sticky Holsters for years now, since we were first introduced to them by a GunLink Forum member. Since then, we have tried out and reviewed a number of their products, including their standard holsters in a variety of sizes, as well as their Super Mag Pouch, and the custom ECR-compatible holster for Viridian’s C5L compact light and laser. We have had great experiences with Sticky Holsters’ products over the years and are happy to have them come on board with us as a SHOT Show Coverage Partner this year. Operations Manager, Eric, sent us over some details about the latest products coming out of the Sticky Holsters shop and we’re excited to get the opportunity to see them first hand at SHOT Show next week. 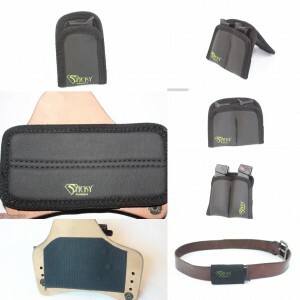 Sticky’s new products aren’t necessarily directly pistol-holster related but, rather, geared more toward the EDC stuff that you might lug around if you are packing heat already, like spare mags, tourniquets, a knife, etc.